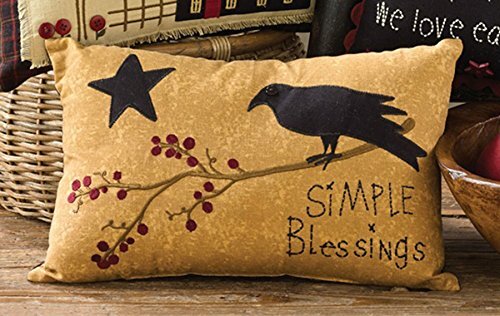 9 inch X 14 inch accent pillow with an embroidered phrase: Simple Blessings. Embroidered accents include a branch with berries and an applique star and crow (with small black button eye). The back of the pillow is a black and dark red plaid (see photo #2). The pillow is finished with a seam at the bottom in tan thread.